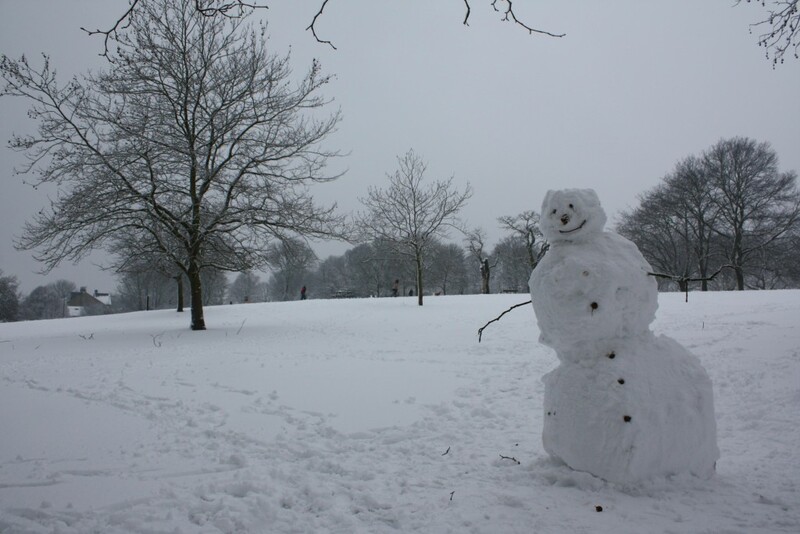 This year’s Christmas card photo is of a snowman in a snowy Eaglesfield Park from a few years ago. 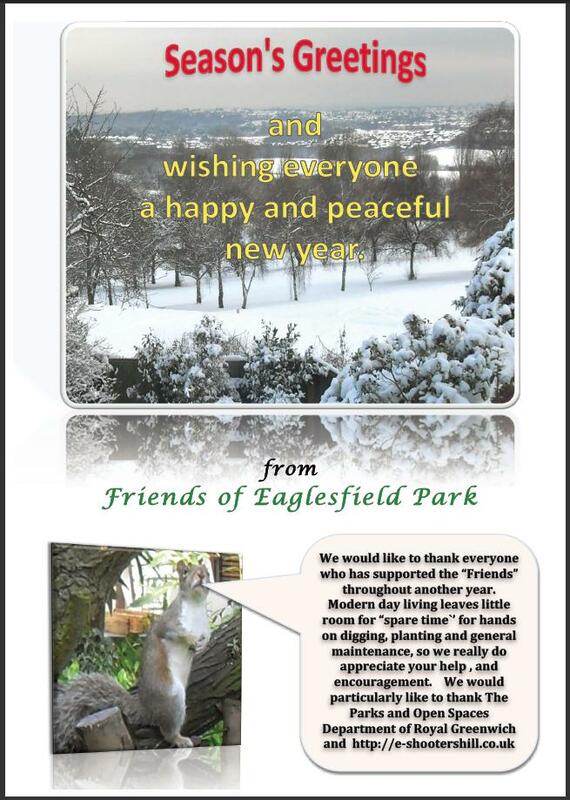 As in previous years I’d like to combine my season’s greetings and best wishes for next year with those of the Friends of Eaglesfield Park – their card is included below. As well as wishing everyone a happy Christmas, Madeleine from the Friends wrote to thank all who volunteered at the park for their hard work over the last year, and also with an update on recent work at the Lilly Pond and changes in the park such as the new sign posts and information boards. 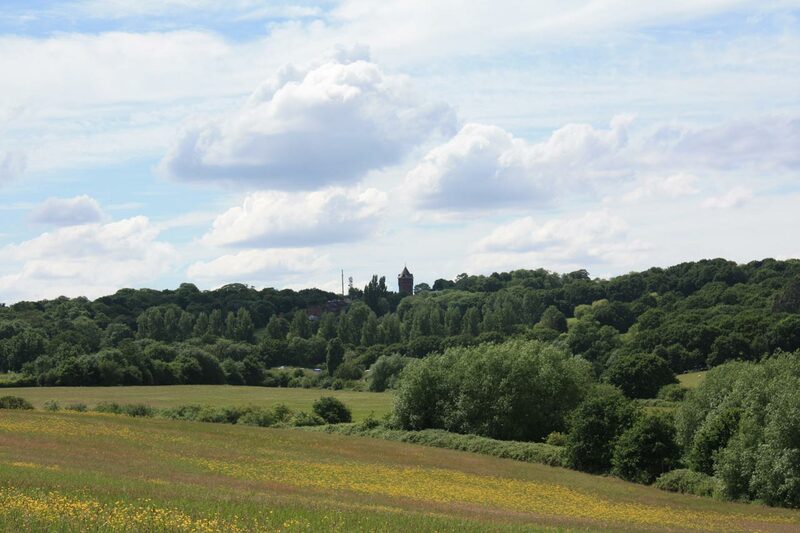 She has written about all this on the Friends of Eaglesfield Park blog, which has some great photos of local wild life, including a sparrow hawk that got trapped between a wire fence and a wooden fence panel. The blog is well worth a visit. 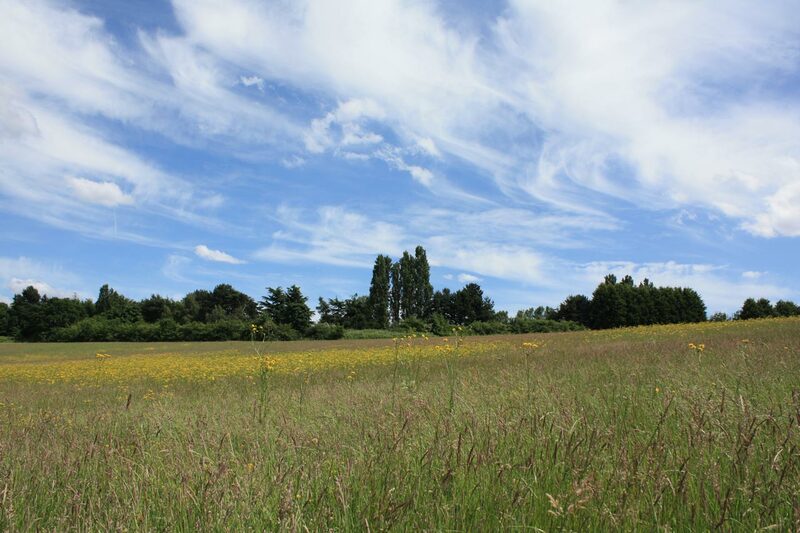 Most people who visit Woodlands Farm don’t get much further than our farmyard, however there are a further 85 acres of wonderful London countryside, wood, hedges and meadows, to explore. 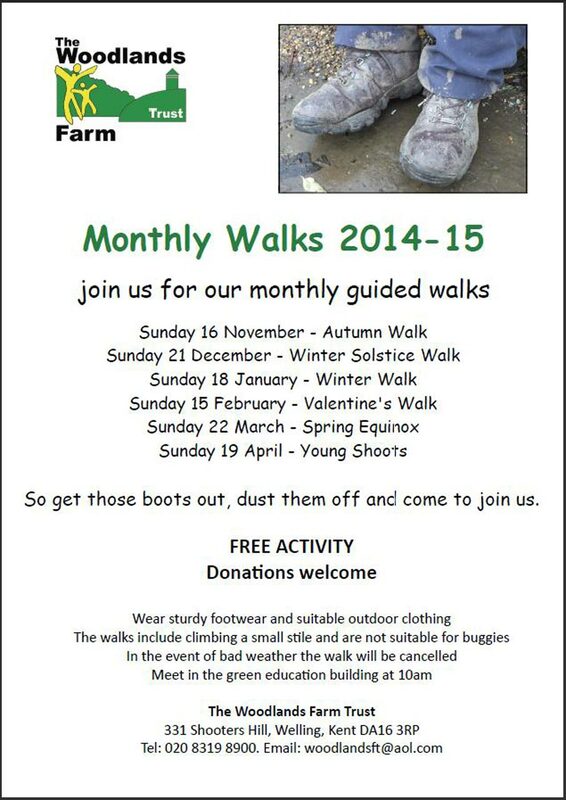 So join us for our monthly guided walks around the farm in all seasons and all weathers. Our walks will highlight seasonal farm activities such as hedging, lambing, the history of the farm and how it works. Meet at the Green Education building at 10 am. The walk will take about two hours. Please wear stout footwear and appropriate clothing for a winter walk. As we will be going through the fields we regret that the walk is not suitable for buggies or those with restricted mobility. In the event of bad weather the walks will be cancelled. The walks are free, but we appreciate any donations. Although you do not need to book if you would like to let us know you will be attending or have any questions please call 020 8319 8900. Sunday 21 December – Winter Solstice Walk, On our solstice walk there will be a seasonal hot drink at the end. So get those boots out, dust them off and come to join us. And as an extra bonus on Sunday the walk will finish with a glass of mulled wine. 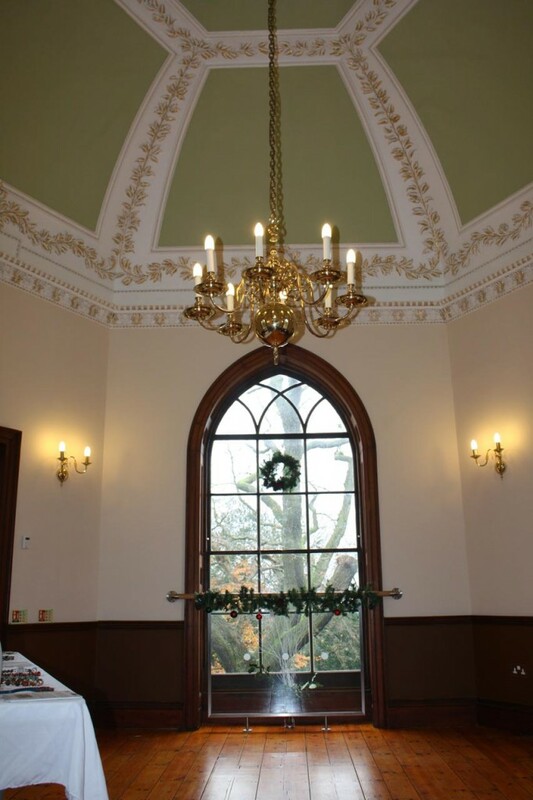 The Lady James Room at Severndroog Castle is the venue on Sunday 14th December for a performance of Charles Dickens’ “A Christmas Carol” using the reading script that Dickens himself adapted from his book and followed for his own public readings. Dickens gave the first public reading in December 1853 and read it 127 times up to the time of his death in 1870 with audiences of up to 3,700 people. 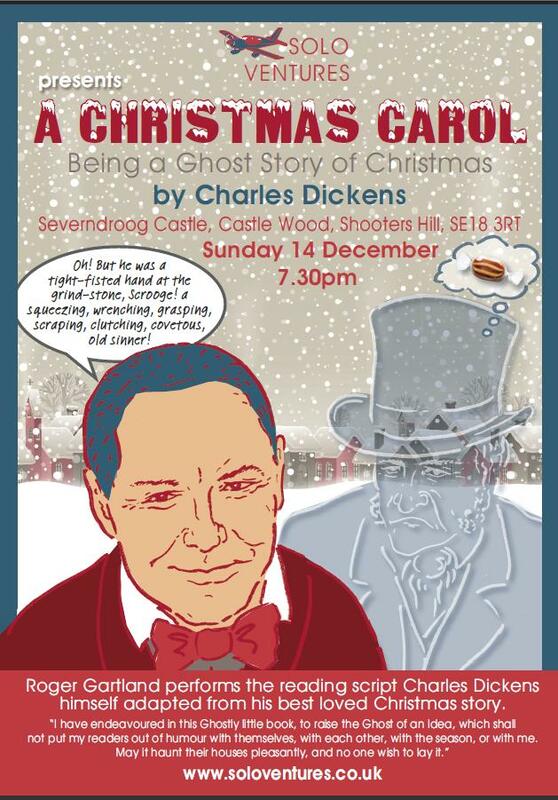 The Severndroog Castle Building Preservation Trust have arranged to have a fundraising reading of Charles Dickens’ “A Christmas Carol” for one night only, at Severndroog Castle, on the evening of Sunday 14th December 2014. Seats are strictly limited by the constraints of the castle size, and early booking is advisable. The reading is by Roger Gartland, formerly of the National Theatre company, who has performed this traditional Christmas work for a number of years, to sell-out houses in a variety of venues. The tickets are £12 each and include a mulled wine/soft drink and mince pies during the interval. Tickets can be brought for cash at the castle during opening times on Thursday, Friday and Sunday, or online from http://www.eventbrite.co.uk/e/a-christmas-carol-a-ghost-story-by-charles-dickens-tickets-14748817109 There is a small booking charge when booking online. Show lasts approx. two hours, including 15 min interval. Probably not suitable for children under 10 years. Roger Gartland trained in repertory and was a National Theatre player for seven years. He was a co-founder of, and toured with, the touring theatre company “Not The National Theatre”. He has appeared at the Globe Theatre and in the West End, and his work also includes film, radio, voice-overs and TV. What a very Christmassy thing to do – a performance of A Christmas Carol in a gothic folly in the woods accompanied by mulled wine and mince pies.